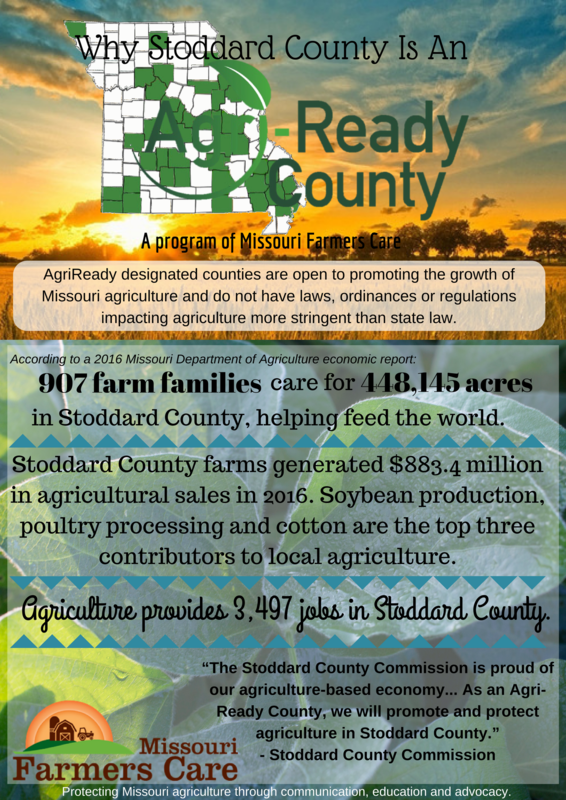 Stoddard County, an agricultural powerhouse in southeast Missouri, has applied for and achieved Agri-Ready County Designation by Missouri Farmers Care (MFC), a coalition of 45 leading Missouri agricultural groups. This designation identifies counties that create an environment conducive to agricultural opportunity and growth which are willing to actively support Missouri’s largest industry. Agriculture is the largest driver of the Stoddard County economy. In 2016, the county’s 907 farm and ranch families and agribusinesses sold over $883.4 million in agricultural products, translating into $295.1 million in added value to the local economy. Agriculture, forestry and other related industries support 3,497 local jobs, according to the Missouri Department of Agriculture (MDA) Economic Contributions of Agriculture and Forestry Study. The county’s agricultural strength is anchored in the value of soybeans, poultry processing and cotton. Through the Agri-Ready program, MFC will partner with county leaders to advance local agricultural enterprise, promote the county as a conducive location for business expansion and enhance workforce readiness for agricultural careers. MFC will recruit local FFA and 4-H students to implement Agriculture Education on the Move™ in third grade classrooms. These student leaders will present agricultural careers and crop and livestock production through engaging, hands-on activities and lessons while developing their speaking and leadership skills. In addition, the collaboration encourages participation in the Missouri Department of Agriculture’s voluntary Agricultural Stewardship Assurance Program, recognizing stewardship at the farm level. Stoddard County joins Atchison, Audrain, Barry, Benton, Bollinger, Butler, Carroll, Chariton, Cole, Cooper, Crawford, Dallas, Dent, Franklin, Gasconade, Laclede, Lawrence, Lincoln, Madison, Marion, McDonald, Miller, Moniteau, Montgomery, Morgan, New Madrid, Newton, Oregon, Osage, Pike, Polk, Saline, Scott, Shannon, St. Clair, Sullivan, Washington, Wayne, Webster and Wright counties in achieving Agri-Ready Designation.